On this tour, you will enjoy a fully narrated swamp tour by one of our local captains in the comfort of a swamp tour boats. Our tour boats feature a roof, cushioned seats, windows that can be raised or lowered for the weather, restroom, and plenty of standing and walking room. You will enjoy close encounters with the indigenous swamp life as you learn about what it is like to live in the Louisiana swamps. You will return to you hotel around 5:00pm. 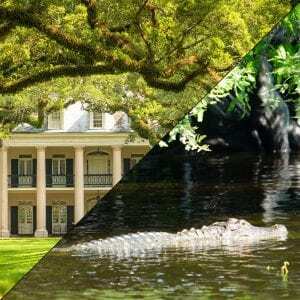 Oak Alley Plantation Tour – House tour about 35 minutes, Hotel Pick Up and Transportation included. The Oak Alley plantation tour is one of the most magnificent plantation tours near New Orleans because of the 28 evenly spaced, huge Oak Trees that go from River Road to the Plantation House. It looks like the movie “Gone with the Wind”. The Greek Revival style home dates back to 1837. Located on the grounds are a restaurant, blacksmith shop, souvenir shop and antique farm equipment. The Oak Alley tour is the complete plantation experience! The Oak Alley house tour is approximately 35 minutes and is conducted by tour guides dressed in authentic plantation style apparel.Walking is required for this tour. The distance from the Plantation house to the restaurant and souvenir shop is about one block in distance. Along the path, there are benches shaded by the oak trees. Over the years, many wonderful and fascinating individuals have had a hand in shaping a dream for Oak Alley … some tried and won, some tried and lost, others just tried and gave up. Still, they all had one thing in common … they CARED enough to try. Most of them are gone now, leaving only bits and pieces of the whole story … yellowed documents in parish archives, remembrances shared from generation to generation, a letter or two, and faded photographs. But most important of all, Oak Alley herself. Oak Alley’s adaptive restoration in 1925 by her new owners, Mr. and Mrs. Andrew Stewart, was the first example of antebellum restoration along River Road. Through the years, Oak Alley was the scene of many events affecting those who had given her a second chance at survival in the struggle against time and the elements. Josephine Stewart outlived her husband by 26 years. Shortly before her death on October 3, 1972, Josephine created a non-profit foundation which would be known as the Oak Alley Foundation. Since then, the home and 25 acres of grounds has remained open for all to share. We are only 35 minutes from New Orleans yet a world apart. See the Cajuns of the Bayou living and surviving in harmony with the swamps. Here, the waterways are their highways. From the relaxed comfort of our covered New Orleans Swamp Tour Boats, you will drift slowly past a 2000 year old Indian Burial Mound, a Cajun cemetery and Fishing village! You may see the wildlife that made the Barataria Swamps the Crown Jewel of the Louisiana Purchase. Here, birds, snakes, turtles, fur animals, and Gators are the king of the swamp and easily spotted in Spring, Summer, and Fall. Gators do hibernate during the cold winter months, but lay on the bayou banks on warmer days. So even in Winter, our native Captains can sometimes find a sunning Gator on our tour. The slow drift of our tour boats through moss draped trees and small waterways, will provide ample opportunity for viewing and photography. The New Orleans swamp tour boats are fully narrated and our captains are natives of the Barataria Swamps with a background of gator hunting, fishing and trapping. They will entertain you and amaze you with the ecology of the swampland. They have lived the life! Your Comfort is Guaranteed on Our Tour Boats. They Have a roof, restroom, cushioned seats, and windows that can be raised or lowered during cold or rainy weather, along with plenty of standing and walking room. These tours are Entertaining, Educational and Exciting. It provides you with a relaxing view of our beautiful swamps.